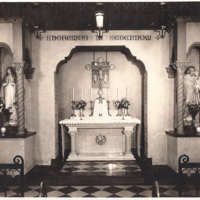 The interior of the chapel at St Catherine of Genoa in Brooklyn, which the Sisters used for prayer. 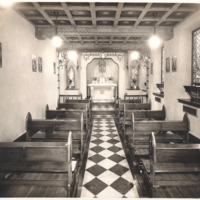 When the Sisters moved to their new convent in 1928, many remarked at what a "gem" the new chapel was. The front doors to the St Catherine of Genoa Church. 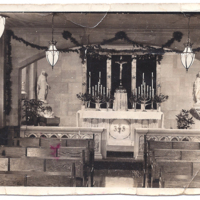 The original church was dedicated and opened in 1912 through the work of the parish men and boys. An angled view of the St Catherine church. 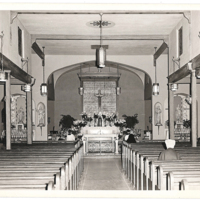 The original church was damaged by fire in 1923 and was re-opened in 1924 with substantial changes. The interior of the church at St Catherine of Genoa. 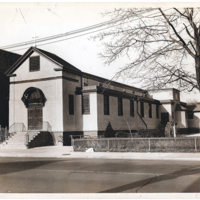 In 1923, the church was badly damaged by fire and parishioners went to Mass at the County Building on Clarkson Avenue. 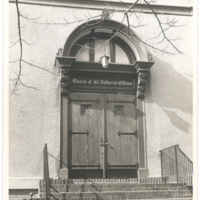 The rebuilt church opened in 1924 and was enlarged. 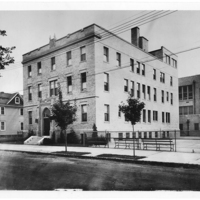 The exterior of the convent used by the Sisters at Sts Joachim and Anne parish. 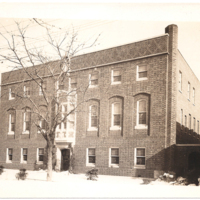 The convent, complete with a roof garden, was built in 1930 to give more space to the Sisters who had previously lived on the second floor of the school.